There’s no such thing as a slow day when you’re an entrepreneur. To me, the most anxiety-producing days are the ones where a lot of people need my time. These are days filled with a never-ending stream of meetings, calls, requests, and interactions — with little time to reflect in between. And when the work backlog keeps rising, and I don’t have a minute of “think time” to myself, it can be easy to start operating in a reactive (and not proactive) state. I love people. I actually thrive when managing teams. But part of being successful is finding ways to remain calm and clear during hectic moments of the journey. 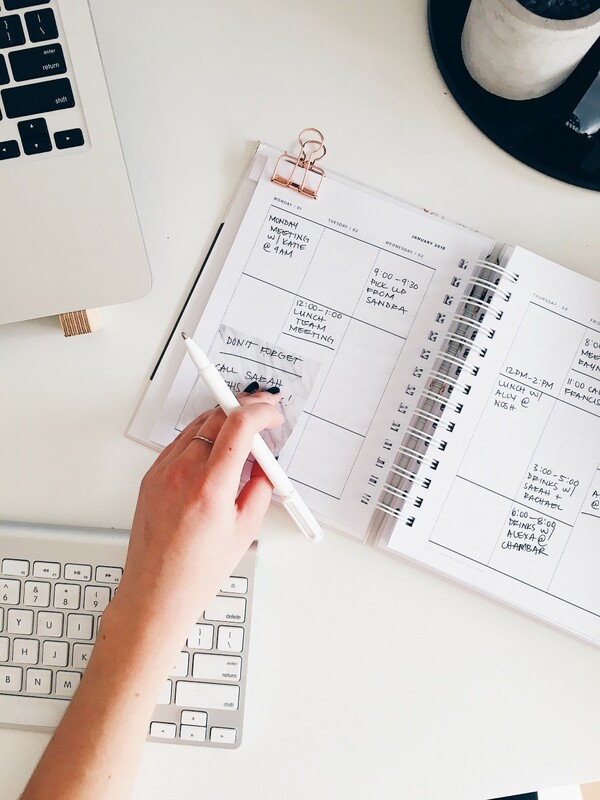 When my days get crazy and difficult to manage, I use a series of productivity hacks, mental tricks, and other strategies to make sure I’m achieving progress, not simply motion. 1. Block out time for everything, not just meetings. Try putting everything you need to accomplish on your calendar. For example, I might block off ninety minutes to develop a plan for a makeup testing panel (my startup, NakedPoppy, is a clean beauty company), or an hour to work on recruiting. Blocking time also prevents me from spending more time than I think the task is worth — when the time is up, it’s time to stop. I even block off time on my calendar to think. I set aside “think time” at least three times a week. “Think time” means no phone, no peeking at Slack, and no checking emails — just deep thinking and concentration. I learned this “deep thinking” approach from Victoria Treyger, a wonderfully successful former executive turned venture capitalist. 2. Do one thing at a time. Period. When you’re extremely busy, there’s the temptation to multitask. Have you ever had that moment when two people are texting you, someone is sending you Slack messages, and someone else is trying to get you on the phone? When it happens to me, my initial impulse is to jump from one to the other and answer everyone as quickly as possible. But I try to fight that instinct and instead focus on each conversation to give it the attention it deserves. For example, if I’m on a call, I try to be 100% present. That means no texting or looking at email. When you multitask, you end up with two (or more!) suboptimal results. Give all your attention to a single interaction at a time, and the outcome will be better. 3. Start each week by writing down 1–3 actions that will move the needle on your business. At the beginning of each week, I write down the top three actions — in priority order — that I need to take to move the business forward. I revisit them daily to keep my focus. The work that matters most is rarely the quickest or easiest. It could be recruiting key talent, launching a new initiative, or raising money. It’s easy for these larger efforts to get pushed to the next day, and the day after that, and so on. So I make sure that the first thing I’m thinking about each morning is one of my top priorities. 4. Scan your calendar in advance. Optimize when needed. Don’t let another person, no matter how trusted, take full control of your time. It’s YOUR time. Scan your calendar in advance and re-calibrate if needed. For example, maybe there’s a non-urgent meeting that requires a level of thoughtfulness you can’t summon on a crazy day. Reschedule the meeting. The key is to do the rescheduling well in advance. That’s far more gracious than running late, being distracted, or postponing at the last minute. 5. Resist the temptation to put off certain internal meetings. This might sound like it contradicts the previous point. But try and resist the temptation to delay internal meetings when team members need your input in order to move forward. I want my team to feel happy and valued, which in itself advances the business. And they often just need a quick clarification to be more focused and productive. Even on the craziest days, remember that your leverage comes from your team. Help them be more productive, and you’ll amplify your accomplishments. 6. Set your perspective at the beginning of each day. If you start your day with a mentality of, “I have way too much to do today!” you’re setting yourself up to feel overwhelmed. To counter this, I say to myself, “I have plenty of time to do what needs to be done today.” This mindset helps me open up my body and mind to accomplish what matters most. I can then take a deep breath to prioritize, break tasks down into manageable chunks, and block off the calendar time to get them done. When you’re stressed out, it’s easy to skip the things that keep you sane. But don’t forget that the success of your business or career is closely tied to your wellbeing. I treat meditation the same way. If it’s a crazy day, and my mind is really racing, I tell myself that meditating for even three minutes is better than not doing it at all. And if you don’t have three minutes, you don’t have a life. Finally, I never shortchange myself when it comes to sleep. I get my eight hours. For me, productivity depends on feeling rested. I’m fortunate to have few physical distractions during the day — no pain, sleepiness, or brain fog — and believe that for me it’s the result of prioritizing sleep, meditation, and exercise. 8. Don’t forget to enjoy it. When I’m at my most overwhelmed, I remind myself that I’m lucky. I’m co-founder and CEO of a company I love, which is a passion project as well as a business. What a privilege it is that I have this busy, exciting day, surrounded by people I enjoy. When I start to feel overwhelmed, my favorite way to ground myself is to remind myself that it’s a marathon and not a sprint. Make sure you have a set of tools (I hope some of my suggestions will help you!) to give you the mental and physical fortitude to succeed. 8 Productivity Strategies You Can Use To Take On The Most Hectic Days was originally published in The Mission on Medium, where people are continuing the conversation by highlighting and responding to this story.